It’s a wet Saturday night, and there’s a group of us standing in Farringdon’s Bleeding Heart Yard, waiting impatiently for Elizabeth. She’s not that mate who’s always late: she died over 400 years ago. Elizabeth is a ghost. At this time of night on a weekend, you’d usually find me downing spirits rather than seeking their company. 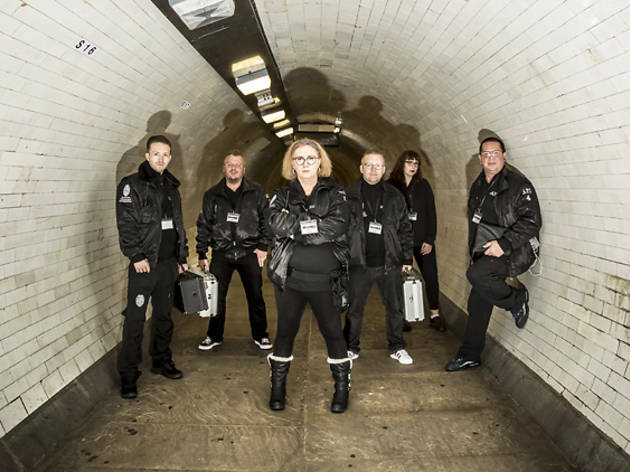 But tonight I’m on a mission, travelling to three of London’s most haunted places with a group of six paranormal investigators in an attempt to meet a spook. I’ve got until midnight. By the time Hazel Williams, Head of Investigations at Spectrum Paranormal, starts calling for Elizabeth to make herself known, I’m trembling like Scooby-Doo. I know what you’re probably picturing – a medium in a channelling trance or a priest yelling ‘Show yourself!’ – but Hazel’s using Flir, a thermal-imaging app on her phone. She explains that it will show a drop in temperature if any phantoms are about. We stand and wait. London’s history – plague pits, royal executions, grisly murders – makes it fertile territory for paranormal goings-on. Most streets in this city have witnessed something horrific, Bleeding Heart Yard more so than most. Legend has it that its name comes from the murder of seventeenth-century socialite Elizabeth Hatton; her body was found ‘torn limb from limb, with her heart still pumping blood’. Tonight there’s no sign of her on Flir. Maybe the rain put her off. Elizabeth may be having a night off, but the Spectrum team, based in Primrose Hill, have seen more than their fair share of unexplained phenomena since the company was founded in 1996. Hazel started the group after experiencing strange events, including what she describes as ‘prophetic dreams’. It’s a family affair: two members, Head of Operations James Williams and Head of Social Media Dean Williams are her nephews; then there’s a head of security, a field investigator and a trainee investigator. Although some members of the group are sceptical, a big draw for them is the chance to try and solve ‘unanswered questions’. They do this through on-site ‘field investigations’: setting up their equipment in spots rumoured to be haunted, then attempting to work out what is actually going on. They are serious about helping members of the public get to the bottom of strange things happening in their homes. Dean, who has wanted to be a ghostbuster since seeing the original film as a kid, looks after Spectrum’s phone line. He tells me that he often fields calls in the middle of the night from people convinced something spooky is going down in their house. ‘It can be difficult because I have a day job,’ he says. ‘But if we can help calm people down, it’s worth it.’ The group meets on Thursdays to discuss if a call is legitimate. If they believe there’s something to it, they make the trip to investigate. Their work has taken them all over the country, and they only ask that their clients reimburse them for petrol. The ghostbusters comparison is understandable, though. The team wear matching black jackets emblazoned with their logo and carry loads of weird equipment in silver suitcases. There are ouija boards to contact the dead and meters to measure electromagnetic changes caused by spirit activity, plus voice recorders and cameras to pick up anything untoward, dowsing tools that move a certain way when ‘yes or no’ questions are asked… ‘and, of course, the obligatory crucifix,’ adds James, laughing, as he holds up a wooden cross. The group was personally advised on the best equipment for ghost hunting by Maurice Grosse, the paranormal investigator famous for working on the Enfield Poltergeist case in the late 1970s. The company ethos, though, is that an investigation should be judged by its ‘findings and feedback’, not on the amount of equipment involved. As we drive to our next location in one of Spectrum’s branded cars, I ask James to tell me the scariest thing he’s seen while investigating. ‘One time, I was at The Spaniards Inn in Hampstead,’ he says. ‘I looked up and there was a man in Stuart dress staring at us. He had a hideous face.’ This tale really gears me up for walking through the Greenwich Foot Tunnel, which runs under the river to the Isle of Dogs. The tunnel looks very sinister. It’s a grey, claustrophobic, 370-metre tube. James says people have told them they’ve heard footsteps behind them as they walked through it alone at night. There have been sightings of a ghostly Victorian couple wandering its length too. Tonight, we just get living members of the public wheeling their bikes along and giving our equipment funny looks. Still, I get the sense it’s not a place I’d like to walk through on my own at any time of day. With the witching hour fast approaching, we can’t stay south of the river for long. It’s time to hit our final location of the night: St John-at-Hampstead churchyard. James explains that Spectrum regularly conducts investigations here. It’s open all night, easily accessible and reportedly haunted by several resident ghosts. These include an old man known to follow people about and the ‘Red Lady’, a Victorian woman who murdered a baby in her care. She’s believed to wander the graveyard carrying the corpse in a carpet bag. I don’t fancy meeting either of them. When asked about the weirdest thing she’s experienced here, Hazel recalls: ‘A few years ago I was in the cemetery at about 1am with a friend doing an investigation. There was a woman here with a camera and tripod, behaving oddly. She asked us to get her some alcohol. I turned around and when I turned back she’d vanished without a trace. There’s no way she could have packed everything up and left that quickly. It happened over there, by the way.’ Hazel points to a clearing right in front of us. I get chills. I’m not going to lie. Whether you believe in ghosts or not, this place is as creepy as hell. Overgrown shrubbery looms over broken and leaning gravestones. Centipedes crawl over tombs. The church bells ring ominously and there’s a full moon peeking out from behind the clouds. When we suddenly hear what sounds like high-pitched screaming getting progressively closer, I consider doing a runner. That’s until the demon reveals itself: it’s a vixen. But still, something feels off. We hear weird laughter and twigs crunching underfoot. I’ve been entrusted with the K2 meter, a device that flashes red when there’s an electromagnetic disturbance. It starts spiking on and off. Eventually, Hazel gets out the P-SB7 Spirit Box, a walkie-talkie-resembling piece of equipment that uses radio waves to generate white noise. It’s said to help give ghosts the energy they need to make themselves heard. We stay there for a while, letting the box scan while Hazel puts questions to any spirits who might be present. Nothing happens for a while. Then we hear a low growl of ‘get out’. Or at least we think we do. The air temperature around us drops dramatically. I move away from the Spirit Box, then it suddenly goes silent (even though it’s still scanning). Looks like we’ve annoyed something. The church bells start to toll midnight: it’s time to go. I might not have seen an apparition tonight, but I’ve had a good scare. I’ll stick to spirits that come with tonic in future. Spectrum Paranormal Investigations run ghost hunting events throughout the year. Find out more at www.spectrumparanormal.co.uk. Inspired to go looking for ghouls? Check out London's creepiest locations.